Mack is inspired by transcendent visions, nature, and technology. His work is informed by research in a wide range of fields from neuroscience to artificial life. Mack's visions, which began in early childhood, inspired a lifelong dream to share them as immersive virtual reality art. The son of Disney artists, Kevin grew up drawing, painting and sculpting. Kevin attended Art Center College of Design, where he majored in Fine Art, Illustration and Film. After college, Mack supported his experimental art and music working in the film industry as a scenic artist, model maker, sculptor, concept artist, and matte painter for commercials and movies. In 1986, Kevin began exploring the virtual world of computer graphics as an artistic medium. Recognizing the computer's potential for film work, Mack helped pioneer the use of computer graphics for visual effects and became a creative leader in the development and application of digital art technologies. Mack began using artificial life, neural networks, rule based systems, and emergence as tools in the creation of virtual art and visual effects. 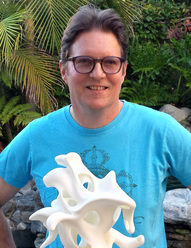 Among the first to exploit the unique capabilities of 3D printing, Mack creates virtual sculptures that cannot be produced by any other means. Mack's work in artificial life and rule based systems, used to grow the computer generated tree in WHAT DREAMS MAY COME, and inside of a human brain in FIGHT CLUB, inspired the development of tissue simulation software that has been used for virtual stem cell research. In 2006, Mack received the title of Honorary Neuroscientist from UCLA's David Geffen School of Medicine for his talks there on perception and visualization. In 2007 he received an honorary Doctorate of Science degree from Art Center College of Design for his contributions to the field of motion picture visual effects. In 2012, Kevin worked with physicists at CERN on the visualization of recent discoveries in particle physics. I have an obsessive fascination with the visions, ideas, and processes that inspire my work. The creation of vivid depictions and expressions of these imagined and emergent realities is my primary preoccupation in life. Technology provides me with an endless palette of new possibilities and enables me to dissolve traditional boundaries of medium, process, style and genre. My intention is to create beautiful psychoactive art that engages the imagination, inspires wonder, and enhances well being. I've been making virtual art using 3D computer graphics for thirty years. I produce prints, animations, 3D printed sculptures and virtual realities. Virtual reality technology makes it possible to experience my art in it's natural habitat. The fundamental innovation of virtual reality is spatial presence - the sensation of being present in a place. The ability to directly communicate the first person subjective experience of spatial presence brings an entirely new dimension to communication. Art is particularly well suited to this new medium because it is experiential. The potential of virtual reality as an art form is mind boggling. ​I've always dreamed of using technology to transport people to places and experiences beyond imagination. Virtual reality has made my lifelong dream an actual reality.